We are rounding out this journey with JoJo. This was a two episode week so here are my thoughts on the Fantasy Dates and the Men Tell All. I’m impressed JoJo can look so put together and fabulous after crying like that. I am a spotchy hot mess after a good cry. Jordan gets the first rose. After this Luke hesitation, I think she is going to pick Jordan to go all the way. My heart just dropped for Luke. He looks so lost. Why is she holding his hand after she just ripped his heart out? I don’t understand this goodbye…she seems so heartbroken. I don’t understand how she didn’t know how he felt. He made a freaking heart rose trail for her?!?!? Luke for the next bachelor!!! So what do you think happens to their individual rooms that they forgo for the fantasy suites? I am sure one of the staffers then uses it right? Robbie is calling her Joelle. That is sweet. How does Robbie have esthetician quality hair when he wakes up? And JoJo’s too. Mine looks like frizzy dookie. I would not really call JoJo’s outfit on Jordan’s date sporty. Tennis shoes don’t make it sporty. We would love that hike. Yes Jordan is too good to be true. He is not ready for a serious relationship. JoJo likes to grill Jordan. Is she going to say “This is our first breakfast together.” to every one? It can’t get better than this” said you 24 hours ago on your last date. I want to be upset about people who sneak up for extra time like Robbie did, but at the same time, if I was in his position I wouldn’t want to be away from the person I love either. Country Clubs and Coloring Books? Chase blowing up at JoJo…He should press her. He was blindsighted. He looks so angry…Don’t tell him that you all would have a great relationship if they had met outside the other relationships. That’s gross to tell someone you are everything I ever wanted. BAHHHH Chase came back to the rose ceremony. She shouldn’t let him stay…I like him, but he shouldn’t come back. Chase just redeemed himself, and opened it up for her to pull a Mesnick or for him to be the next bachelor. These men are just ridiculous. Evan talking about Chad’s steroids is so weird. Bahaha they are all going nuts about Chad. I feel like they are making a big production about Chad…getting his own trailer and the security walk. Come on? Chad dating other contestants ex-gf. “We aren’t all bad guys?” Wow they are getting personal with the intimate. Nick getting up to fight Chad…why is that necessary? But Daniel’s comment about Americans resorting to violence-wow. Because that is helpful. I agree with Chad that Jordan is using this to get famous. Hmm that video of Evan and Chad…it does kind of look like Evan pushed him a little. But Chad’s reaction is ridiculous. Hitting a wall is better than cursing? I really like Wells. I hope he finds love in Paradise. He made some intelligent comments. But I do think by his comments to Chad that some things went down in Paradise. Luke is an adorable hopeless romantic. I didn’t expect you to go home either. Luke as the next bachelor!!! JoJo seriously could be a model. She is always so perfectly put together. Luke is such a gentleman. Chase was also very gracious about the experience. 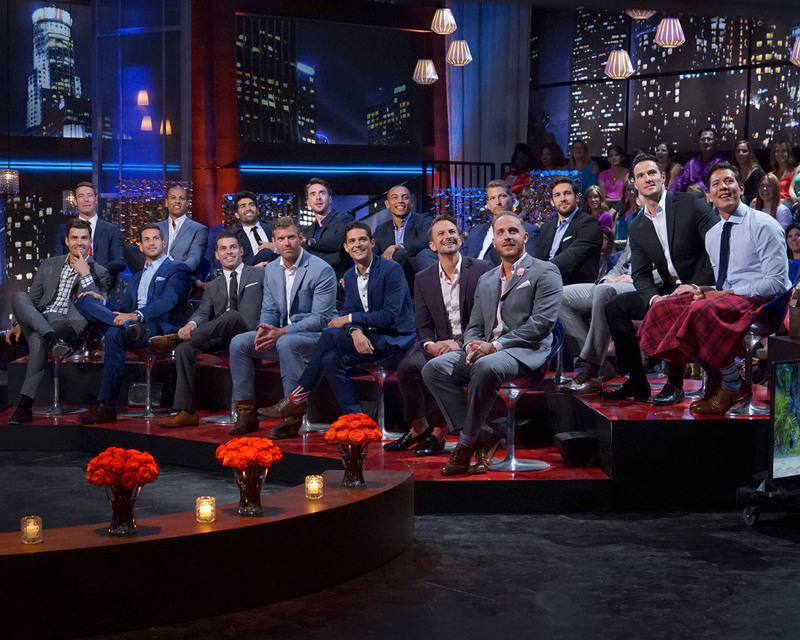 I think either Luke or Chase will be the next Bachelor. 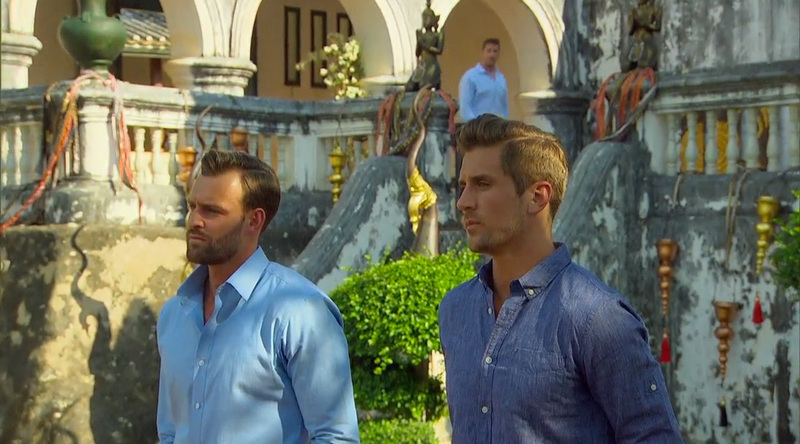 Wow Chad’s comments about Robbie and Jordan (while maybe some truth) was a pretty low blow. Good for you JoJo saying that she shouldn’t waste her breath on Chad. He is stirring the pot, and she was spot on that he was soaking all the attention up. Oh sweet Vinny’s mom. She loves her son. I love the embarrassment! JoJo was hard to read about how this all ends. Taking a look at the finale clips…all the guys are like why am I watching this. My favorites: I have none. I don’t like either Jordan or Robbie. However, I do think she is going to pick Jordan. This entry was posted in Television and tagged Bachelorette, bachelornation, men tell all. Bookmark the permalink.